With my son turning three not too long ago, it had me reminiscing about his 2nd birthday. As it turns out I never shared that fun party with y'all, so thought I would now (you know only over a year later, but who's counting). 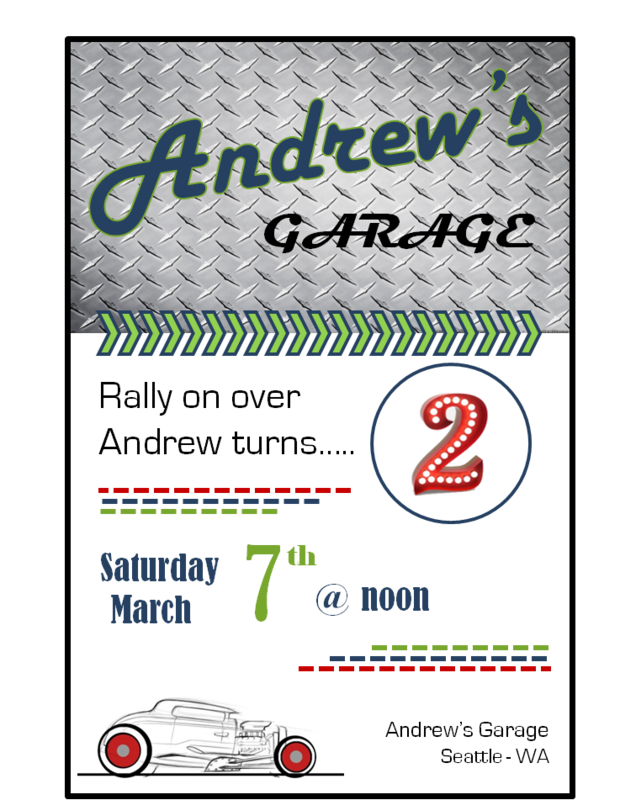 We celebrated with a Classic Car Garage theme. My little man is into anything that goes vroom, I am pretty sure this has been the case since he was just a babe. I created the invitation using the theme and colors for his party as my guide. I think it turned out really cute and is one of my favorites to date! My dining room was transformed into a garage by adding a simple background of black poster board. I took a construction "happy birthday" banner I found at Target and turned it into one that would work for me. I liked the metal look it gave. I took pizza tins from the dollar store and spray painted them black, then added images I found on the Internet to make these replicated vintage garage signs. This cost me a little over a dollar each and they turned out great. I raided my husbands garage, if it was old, rusty or greasy, it was perfect! This party theme was for my little man, but lets be honest it really only gave my husband an excuse to shop for vintage die-cast cars, making a collection of dream cars he would like to own that we probably never will! I did really love the pop of color that each car added to the decorations. This vintage miniature gas pump fit in perfect with the theme and I didn't have to go very far to find it. It is amazing what treasures I was finding that my husband had. Made planning this party and shopping for it, much easier! I came across these cute vintage oil cans and I was shocked that I found a free printable ready to go that fit perfectly to a 28oz aluminum can (I used tomatoes, but whatever you can find would work). Step by step instructions on how to make these can be found on Model Junkyard blog. Easy to make and they turned out perfect for the garage theme! I had goody bags for the kids that I placed in treat bags, from The TomKat Studio, and they were held in a bright red tool box. Because at two these are the kinds of tools kiddos like! Each goody bag had a Hot Wheels car, glow in the dark sticks, car stickers and a cookie for the road! These wrench and screwdriver sugar cookies by the fabulous Sugar Studios were a big hit among kiddos and the adults. They were the perfect addition! What garage would this be if we didn't fuel them back up? For the drinks these red stripey straws from The TomKat Studio were perfect and we kept the lunch simple, with ordered in pizza served on checkered flag plates. For the cake I opted for Old Fashioned donuts as my take on a tire cake (except my son isn't a big fan of chocolate, so these had to do). I stacked them high on two rubber wheelbarrow tires I found at the parts store. These worked out great as decor in multiple areas of the party. However in this case the cake plate was having a hard time balancing and staying up straight, so I stacked the plate on top of an upside down dog dish (that was clean, don't worry). Worked like a charm and almost resembles a large trophy. Sometimes, you just have to do, what you have to do to make that party vision come to life. The vision is always easier in your head! As a fun game for the kiddos, I laid black construction paper down and made a race track, it lead from the foyer and out the front door. So when guests arrived it was also what greeted them. License plate sign (dollar store find), I used a variation of the invitation to welcome guests to the party. My little man! This was such a fun party to plan and soon I'll share what we just did for his 3rd birthday! Hope you enjoyed Andrew's Garage, come again soon! Love this party so much! Very creative! You are too sweet, thanks Goldie! I love this, so simple and classic but still so BOY! Great job Toni! I am looking to start my event planning blag as well and you are a great insipration!